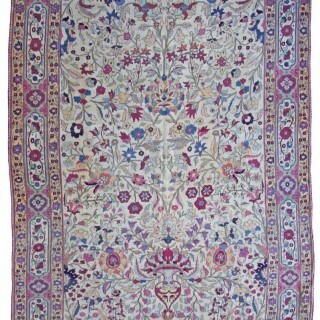 This soft tone antique Kerman (Kirman) carpet has a classical refined and elegant vase design. The pale background allows the soft purples, pale blues and green dyes to really shine. The colour variety is a real delight and would be wonderful to design a room around. Vase carpets are a type of Kerman rug distinctive of the 16th and 17th centuries, are characterized by an allover pattern of stylized flowers and oversized palmettes with vases placed throughout the field. The condition is good, with a flat pile and a tight weave. No damage to this carpet and with the right underlay which we would provide it would sit beautifully flat and preserve it for many years. 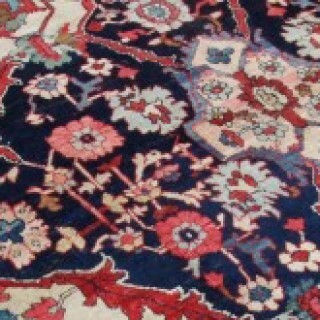 Kirman has long been a town dedicated to carpet weaving in the south east of Persia. Kirman carpets are always high quality, woven on a cotton foundation, designs consist of central medallions with floral motifs. From the 17th century Kerman or Kirman has been a city notorious for fine eleagnt weaving and the famous vase carpets of the Safavid period (1501-1722) are regarded as the most valuable and exquisite in weaving history. Early examples from the 17th century have set records for sales at auctions. We offer the service of viewing any of our carpets & rugs in-situ in London, Surrey, Hampshire and anywhere else in the UK & Europe by appointment. Or visit our showroom in Crondall, Surrey to see a vast selection of both antique and contemporary rugs. The condition is good, with a flat pile and a tight weave. No damage to this carpet .